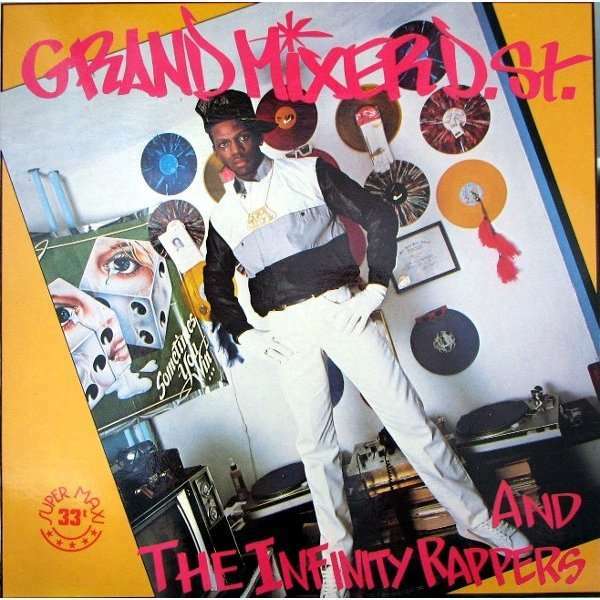 One night in the early ’80s I found myself at a club in Montreal called Cafe Campus, dancing furiously to the live scratching of a hiphop DJ from New York, Grandmixer DST, and his MC crew, The Infinity Rappers. It was en event I will never forget, my first exposure to live hiphop, and blindingly thrilling. In subsequent years I saw quite a few hiphop legends, but none of them were ever able to match the intensity and raw power of that night, almost 30 years ago, when hiphop first rocked my world. My voice, lodged in this analog-gone-digital intersection of sound and space, of funk and flesh, of past and present, networked into the here and now by a remote fellow-traveler, recounted here as story, as curiosity, as blog post. It was 30 years ago fer crissakes, how could it be conjured up so easily? There was so much that was new that night, but the single most powerful memory I have is of dancing to this mixed-up music, with its criss-crossing beats and breaks, tripping and twisting me up deliriously with each rend in the fabric of the funk, grooves interweaving to create a kind of deeply conducive confusion. And along with the MCs pushing the party energy to the max and the spectacular turntablism (Grandmixer DST would be the DJ on Herbie Hancock’s megahit Rockit later that year) the ear-splitting sounds of amplified ‘scratching’ were themselves overwhelmingly new and exciting. It boggles my mind that I can now listen to those sounds on my laptop. Just as – to do a little scratching of my own here – it boggled my mother’s mind when she recently came across a transcription of her grandmother’s personal diary online, on a University of Michigan historical archive site, one in which she was able to click through to the entry describing her own birth! How much of our past is returned to us online? More and more all the time it seems. Do we even want it? Yes I’m excited to listen to these sounds, but mightn’t it have been better for them to remain in my own personal memory vault, where their legendary flavour could thrive without having to conform to (or worse, be diminished by) the actual recording of what actually happened? Or are personal memories just part of the media flow these days, another channel, neither more nor less meaningful than YouTube? Hiphop has come a long way too in the past 3 decades. Maybe it doesn’t want to remember either. Maybe it needs to live in the moment and not the catalogue, to be free to recreate itself. I’m inclined to think this is so, although what hiphop has actually enslaved itself to in recent years is a good question. But one for another post. Still, this might be a good time to mention that I will soon be re-releasing my 2002 book, Digitopia Blues – Race, Technology and the American Voice, in eBook format. Yay! So there will be occasion to revisit some of these issues soon.